Elliot Uchitelle, co-owner of Unique Stone Concepts, talks natural-stone materials. Founded in 2010 by Larry LaBrier and Elliot Uchitelle, Unique Stone Concepts offers a most unique natural stone selection. Their gallery-style showroom features marble, granite and other natural stone slabs, and the staff will assist you with design and selection. SLHL: How do you determine what slabs you offer in your showroom? 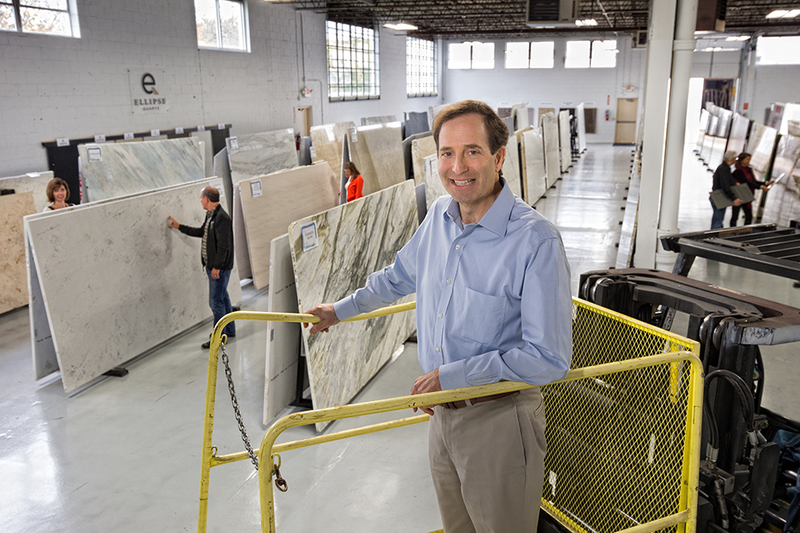 Elliot: We have a beautiful showroom where we exhibit close to 200 different colors of actual slabs so our clients can fully visualize the countertop material. We make sure to have a great variety of colors on exhibit at all times. SLHL: How does a homeowner decide what type of hard surface is best for a kitchen? How about a bathroom? Elliot: Our staff is trained to help homeowners decide which materials best fit their particular job. From granite to quartz to marble and soapstone, we have the right material for every job. SLHL: At what point in the design process should you select your stone? Elliot: We suggest selecting the color as early in the process as possible so that you can then pick cabinets, paints, floor color, etc. that will work with the countertop color. Typically the countertop is the focal point of the project, and we often hear the comment that “I sure wish we had come to Unique Stone earlier in our project.” As far as hand selecting the actual slabs for your project, we suggest picking your slabs about two months prior to installation. SLHL: What is the difference between granite and quartz? Elliot: Both materials are excellent for countertops. Granite is available in literally thousands of different colors and often varies from slab to slab. The number of quartz colors is a little more limited, but they have the quality of being more consistent from slab to slab. Elliot: PolarStone is a truly unique quartz material that looks like marble and is perfect for kitchen countertops. It combines the beauty of marble with the durability of quartz. SLHL: What makes PolarStone different from other quartz products? Elliot: Unlike other quartz products on the market, the veining of PolarStone runs throughout the slab (not just on the surface), and the PolarStone colors have a translucency to them that is truly unique. PolarStone is a true game changer for the quartz industry! SLHL: Which hard surface has the most color options available? Elliot: Granite still offers the greatest number of color options, with new colors being discovered around the world on a regular basis. We pride ourselves on constantly stocking new and exciting colors.